Apollo String of 8 Lights are just the accent to brighten up your party. This uniquely designed string lighting stretches up to 72" between globes. 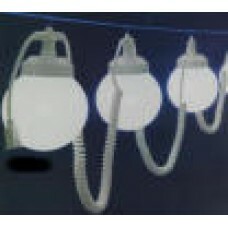 For convenient set up, the string lighting easily attaches to wall ropes on rope tents. Each lighting string interconnects to the next with a plug. The entire stringer then plugs right into a standard wall receptacle.